Balkinization: For one family, war has tragic costs. For others, not so much. For one family, war has tragic costs. For others, not so much. 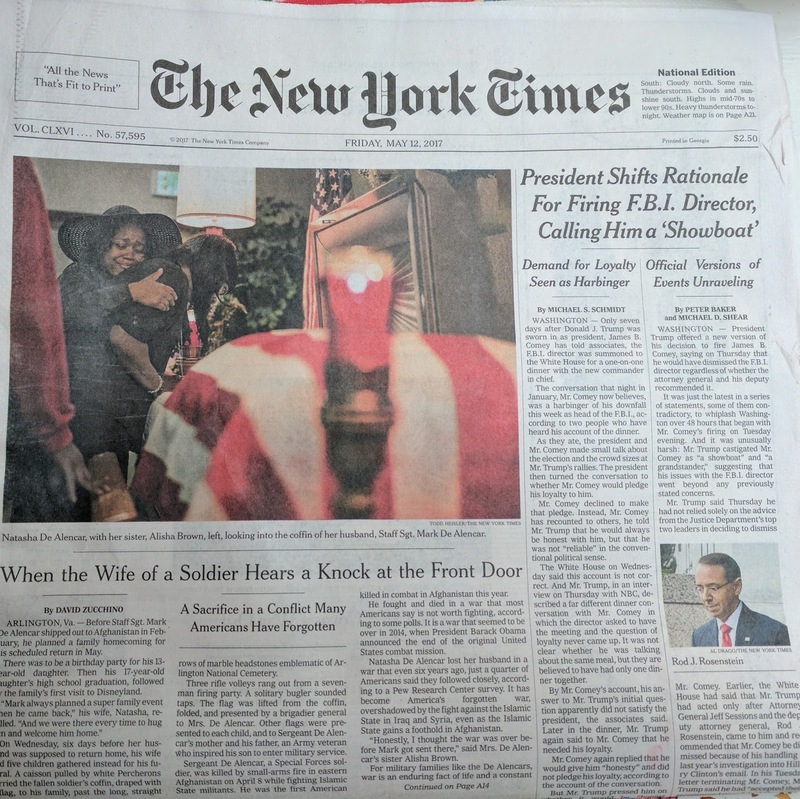 The lead story in the print version of today’s New York Times is a story that barely breaks through in our fast-paced digital communications: a family mourns a fallen soldier. Staff Sgt. Mark De Alencar "fought and died in a war that most Americans say is not worth fighting, according to some polls. It is a war that seemed to be over in 2014, when President Barack Obama announced the end of the original United States combat mission,” wrote reporter David Zucchino. "Honestly, I thought the war was over before Mark got sent there" the soldier’s sister-in-law said. War is present and personal for deployed American soldiers and their families. It is far off the radar screen of most Americans, exacerbated, it seems, by our digital algorithms. The “top stories” in my digital version of the New York Times this morning did not mention Sargent De Alencar at all. "The war didn't seem to affect anyone outside the military," remarked De Alencar’s widow, Natasha De Alencar. His son Deshaun De Alencar emphasized: "His life was not taken: It was given to his country," in an echo of Paul Kahn’s powerful work on the soldier’s willing sacrifice. 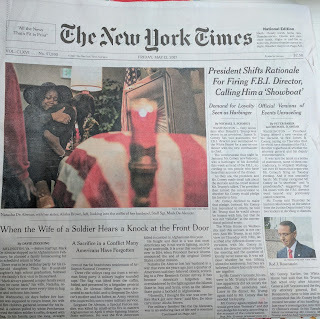 A soldier’s giving of his life for others – for our disconnected and distracted polity – generates a powerful duty that has been ignored. At the very least, a soldier's death in a war fought in our name requires that we pay attention to it. Engagement is our responsibility. But simple attention is not weighty enough to honor this family’s sacrifice. There are renewed calls for Congress to reengage with American armed conflict. De Alencar died in Afghanistan “while fighting Islamic State militants.” Congress has declined to authorize armed conflict against ISIS or in Syria, so that presidents rely instead on creative interpretations of preexisting authorizations for the use of force. This puts the task of defining war’s limits within the Office of Legal Counsel, which defines them in secret memos. This is hardly a source of democratic limits on presidential war power. Though the blame for the absence of restraint falls, in part, on Congress, blame is shared by the American people. I have seen no demands in the recent town hall meetings in congressional districts for congressional engagement with the nation’s use of force. Americans care about what they feel personally. As Natasha De Alencar said, most Americans seem unaffected by the conflict that cost her children their father. The most important democracy deficit in contemporary armed conflict is that a citizenry isolated from war's cost enables ongoing war without restraint.